I'm a little late to the Thursday Next party, but I'm happy to now be a part of it! The Eyre Affair is the first novel of the Thursday Next Series and it was such a fun read. 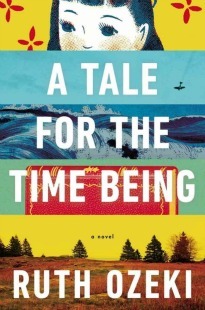 Fford has created an alternate history in which the lines between reality and fiction become blurred and people can literally step into the pages of a book, meet its central characters, and experience the setting for themselves. With that they can also manipulate the outcome of the novel and even kidnap fictional characters. Enter LiteraTec Thursday Next, a literary protector of sorts, working to maintain the authenticity of great works of literature. The barriers between reality and fiction are softer than we thing; a bit like a frozen lake. Hundreds of people can walk across it, but then one evening a thin spot develops and someone falls through; the hole is frozen over by the following morning. If you haven't already guessed, this is definitely a book for book lovers as it's filled with literary references. I don't want to give away much of the plot, because the not knowing is what makes it so enjoyable. The story is incredibly imaginative and odd, but I mean that in the best possible way. I will say it took me about 100 plus pages to really get into the book, so don't get discouraged if you pick it up and feel confused or removed; if you keep going I promise you will be rewarded in the second half of the novel. I should also mention you'll probably enjoy this book much more if you have already read or are very familiar with Jane Eyre. 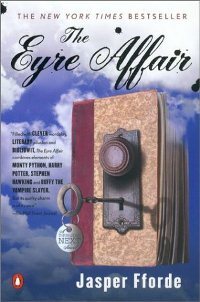 I wouldn't say Rochester and Jane are main characters per se, but their story is at the forefront of the novel (hence the title The Eyre Affair) and the bits in which they appeared were among my favorite parts of the book. Fford did a great job maintaining the genuine feel of the characters and I appreciated the novel that much more because of those details. All in all this was a fun, substantial read. I'd recommend it to anyone who enjoys studying literature and those who love Jane Eyre. A special thanks to Alley for recommending this book so highly. There are currently a total of seven books in the Thursday Next series and I look forward to picking up the second, Lost In a Good Book. Yay I'm SO glad you liked it! The other books in the series are even better than this one. I read this and didn't bother to read any other Fforde for a few years before I stumbled on Lost in a Good Book. And then I was hooked. The others are better than this one?! That's great news! I figured they would slowly go down hill. Now I'm even more excited for the second. I'm glad you liked it. I really enjoy this series (I'm on the 5th book). It's so much fun! If you read the next one you'll get to spend some time with Miss Havisham who is one of my favorite characters in the series. Oh no! I've never read Great Expectations! Yeah, I picked this up last year after Alley mentioned how amazingly-awesome it was. I still haven't gotten around to adding it to my reading schedule (that sentence should overwhelm me). I love the book references. & The premise sounds like fun. Glad you enjoyed it! I'm glad you enjoyed this one. I read it last month when I was on holiday. I was surprised by how dark it was, in a good way. I have Lost in a Good Book on my nightstand and I'm hoping to get to it for this years RIP. Great book! Love the literary references although it made me feel a bit under read. Laughed out loud a lot! I want a pet Dodo. Thanks for the review! JE is my favorite book, so I was skeptical about picking up this one, afraid it would disappoint. But I think I'll have to give it a try now! Thank you for mentioning that the first 100 pages might not engage me. I tried this book a few years ago and dropped it after a few pages - I'll give it another go! I just read this one in July. It's so nice when a novel lives up to all of the hype! I've been meaning to read this series forever. Once I finish the Alafair Burke series, this one may be next.